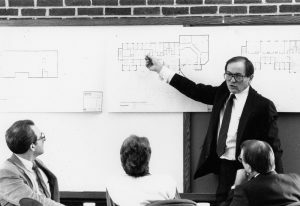 LeRoy S. Troyer, the architect who spent four decades as lead planner and designer of Eastern Mennonite University’s campus buildings, died Sunday in South Bend, Indiana. He was 81 years old. LeRoy Troyer in front of EMU’s Campus Center. Among his other accomplishments, his obituary in the South Bend Tribune noted he was a pioneer in the area of intergenerational living. Troyer led the planning, design and development of Southfield Village, a neighborhood that serves as a national model for intergenerational living in South Bend. His firm was also involved in other faith-based projects such as the 510-foot Ark Encounter structure in Williamstown, Ky. He sold The Troyer Group this past March. Troyer was an active contributor to Habitat for Humanity, serving on the international board and established affiliates in St. Joseph and Elkhart counties. He developed a close working relationship with former President Jimmy and Rosalynn Carter. 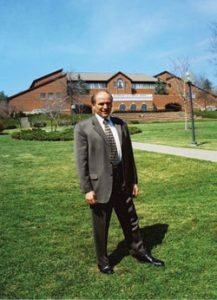 He served on many organizational boards such as Bethel College, Fourth Freedom Forum, The Fuller Center for Housing, Habitat for Humanity of St. Joseph County, MEDA and Nazareth Village, among others. He is survived by his wife of 60 years, Phyllis, and three sons, Terry (Cyndi) Troyer, Dr. Donald (Beth) Troyer and Ronald Troyer, all of South Bend; seven grandchildren, Kendra (Josh) Drake, Seth (Abby) Troyer, Luke (Macy) Troyer, Weston (Collette) Troyer, Will (Abby) Troyer, Wade Troyer and Sophie Troyer; and seven great-grandchildren. He also is survived by three siblings, Esther (Melvin) Mast, Lloyd (Loretta) Troyer and Edna Hochstetler. 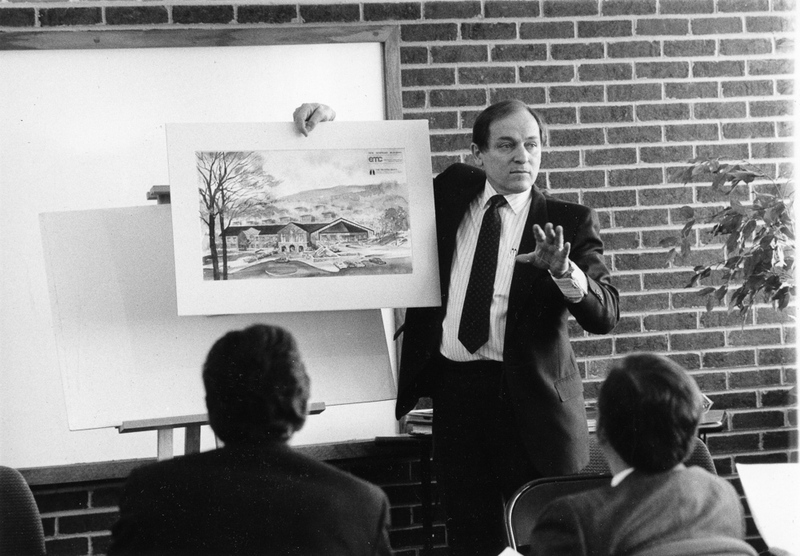 LeRoy Troyer shows seminary designs to the campus community prior to the 1992 groundbreaking. Visitation will be from 3 to 8 p.m. Friday, Dec. 7, and 9 to 11 a.m. Saturday, Dec. 8, at Kern Road Mennonite Church, 18211 Kern Road, South Bend, where LeRoy was a founding member and architect of the church itself. Celebration services will be conducted at 3 p.m. Saturday, Dec. 8, also at Kern Road Mennonite Church. In lieu of flowers, contributions can be made to the following organizations: The Fuller Center for Housing, P.O. Box 523, Americus, GA 31709; Habitat for Humanity of St. Joseph County, 402 E. South St., South Bend, IN 46601; and Hope Ministries, 432 S. Lafayette Blvd, South Bend, IN 46601. LeRoy was a truly gifted architect with a passion for building human-friendly spaces that minimized ecological impact. In this sense, and because he was promoting these values in the 1970s and 80s, he was very much ahead of his time. I had the privilege of interviewing LeRoy several months ago and was struck by his deep sense of calling and his conviction that good buildings can make a real difference for a community. I think this truth is nowhere more evident than in the EMU Campus Center. If ever there was a structure that helped to save a college, this is one. When you replace an eyesore at the center of a campus with something beautiful and highly functional, it can profoundly reinvigorate the perception and “feel” of a place for everyone involved. the harmony of buildings. His creative role as a architect has been a special service in which he used his gifts from God to enhance the work of others across the church. Shalom, Leroy.